As Reno rebrands, what happens to our most vulnerable? Tex went back to Texas, where he’s from in the western Midland-Odessa area, after his mother died there, but now he’s back in Reno, where he’s lived on the streets before. He used to wok in saw mills, but injuries have weighed him down. Still he says he’s a survivor. During the winter he says the key is to keep your feet dry. “I mean, this could be a Vietnam for us out here, 24-7, but you gotta keep your feet dry and clean,” he said. He depends on Medicaid and food stamps and donations from church groups, including lunches and the coat he was wearing. But he says he’s always ready to help someone in a worse predicament than himself. Tex says if there’s events in downtown Reno and people leave a mess, he’ll try to clean whatever can. He says he’s trying to get back on track for his soon to be 18-year-old daughter. “I'm still married but let's not get into that,” he said. “I last saw my daughter two Christmases ago. She's a good kid. She wants to move in with me. I'm trying to get a job and trying to stay out the streets. I'm getting too old for this,” he said. 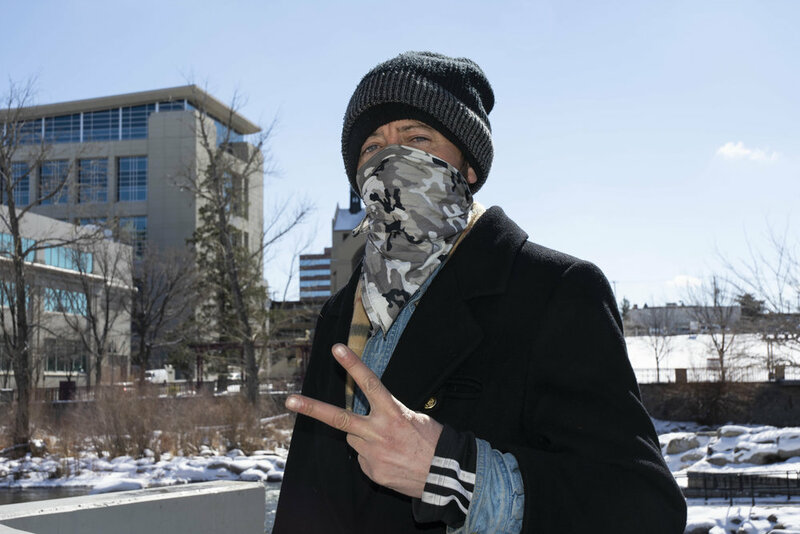 He says the homeless are just criminalized for being in public parks, when they have nowhere to go, and that he’s spent many nights in county jails. He’s worried about the direction Reno is headed with more and more motels being sold off, shut down and demolished. “It's all about money,” he said. "This ain't Vegas. They want to be big and bad. Go to Vegas. Reno is Reno, the Biggest Little City. It says it right there,” he said pointing to one of the arches.